When we arrived on site, the first four of the triangle frames (a very scientific construction term) were in place. We finished them off, then put up some sturdy beams before adding the OSB. Here are Harry and Fefe, a friend of a homeower, taking a minute to figure some things out. 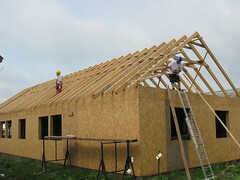 Hooray for Hadju, hooray for roofs, hooray for Habitat for Humanity! Hooray for Kristen and Mary! This almost makes up for you not appreciating Flight of the Conchords, Mary. And spelling your name wrong. Sending you big hugs and lots of good wishes*, I will email soon. *Give both of those to Hadju for me, won't you? Thanks.